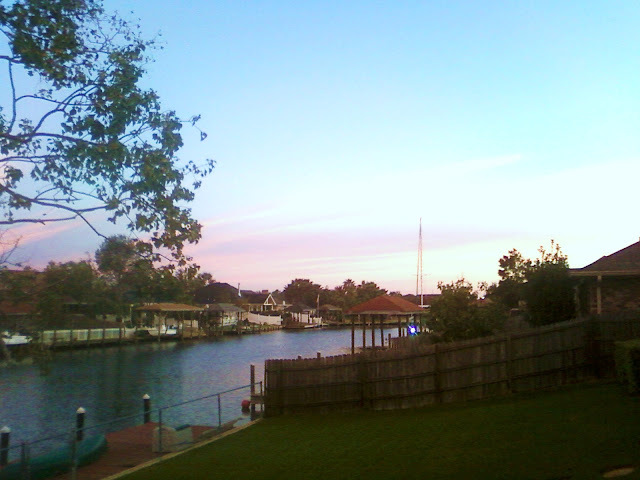 Another beautiful weekend at home ... a view from our backyard and down the canal. This past weekend was just like the last ... beautiful skies and warm weather! Just like the last weekend ... one of us was sick. This time, it was me on the sofa with the Kleenex. Deja Vu? Ken is almost feeling back to normal, and I think I'm on the right track too. A cold front moved in yesterday and we had to say goodbye to the seventy-something degree weather. Luckily, the forecast calls for warmer weather again this weekend. Hopefully we'll both feel better by then! While on the sofa, I again flipped through the pages of Jimmy Buffett's book about his life, "A Pirate Looks At 50". I just finished the book a few days prior, and I wanted to go back and highlight some of the quotes that I loved. I really enjoyed this book! Here is an example of why I like this book so much and the quotes I went back and highlighted: "Fifty is not the age to try and start a new life. Begin your adventures as early as you can. I promise you, you will not get burned out. It actually becomes the most enjoyable way to spend time on Earth as opposed to just pacing the cage". We couldn't agree more! However, we got a late start and we're almost fifty. At least we'll get out there a little before then. Better late than never! Now that I'm ready for another book, I ordered Pat Schulte's (Bumfuzzle) book that just came out yesterday. It's a book that he co-wrote with another free spirit and it's about how to make a living from your computer and day trading. It's called Live on the Margin, and it's also about achieving a lifestyle of adventure without money holding you back. Sounds like my kinda book! Plus, I like Pat's writing style, and I think this book will be easy to read and understand. We know nothing about stocks and trading! I don't have a Kindle (link above), so I ordered my book for my Nook here. If you want paperback, that should be out in about a week. However, Pat's running a special for the next few days. If you send him your receipt for the book, he'll send you an audio version for free. I emailed my receipt today, and I look forward to the audio version for Ken since he hates to read. Ken tackled a long overdue project ... our garage! Our garage is really Ken's garage, and it's where all of his "stuff" is for his construction business. It was a mess, with nowhere to walk. Ken through away a lot of stuff and by the end of the weekend we could actually walk around the garage. We can even reach our motorcycles. Motorcycles?! Yes, we each own one (Ken has a Harley and I have a Honda Shadow) but we've been so busy the past couple of years with fixing our house and trying to make a living that we've neglected them. Ken's bike now needs a little TLC, but we're determined to get some riding time in this Spring before we have to reluctantly sell them. They'd be nice to cruise the islands on, but we just can't find a place for them on Nirvana! Only two more weekends before Christmas?! Thanks to online shopping I'm ready. Sorry you got sick too, but glad you both are on the mend. I hate being sick. I'm going to do my last of shopping this afternoon. I've got my great granddaughter to buy for and then I'll be done too. It's fun buying for the little ones. Great photo of your backyard and canal. I think it's going to be pretty tough leaving such an idylic setting to live on your boat. Especially difficult knowing all the blood, sweat and tears you two invested in your house. Hope you enjoy the holidays and the new year brings you that much closer to your cruising life! Great! Thanks for the link. I was waiting for that book. I used your link to buy, getting my copy via the kindle for PC. But it will not open! ARrrgg! I've had to email amazon.com to get them to figure it out. Pooh. I am ready to read that! Thanks Sandee! Starting to feel better. Great-grandkids ... how fun! The little ones do make the holidays a lot more exciting. Looking forward to grandkids of our own someday. Have a great Christmas! Neophyte, we try not to think about the loss of our house too much. Like you said, a lot of hard work went into it and we love it but ... we're focusing on the adventure to come! Have a great Christmas and New Year! Since we moved to FL a year ago neither one of us has been sick (I probably just jinxed myself), and we think it's because we have so much fresh air since we live on our boat :-) As for weather here, right now it feels like June it's so hot and humid, send your cooler weather to us please. Hope you feel better and get out on the water soon. We have a 3 hour tour scheduled for Saturday.